Thanksgiving may have you in the giving mood, but don’t give in to your pet’s begging for table scraps or leftovers, which could make them sick. This includes cooked bones, which can break down and cause blockages or choking. So, keep the trash closed and, when your pet gives you the big eyes, instead offer them a delicious, healthy treat, like Tiki Cat® Crunchers or Tiki Dog™ Air-Dried Morsels. What’s cozier than a crackling fire on a cold night? Cats and dogs often enjoy the warmth from a fire as well, so make sure your fireplace has a sturdy screen, and ensure that your pet’s bed is a safe distance away from the fire. After dinner is a great time to get moving with your pet. Enjoy some play time with your cat, or take your pup for a nice evening stroll. Keep in mind that it gets dark earlier now, making it harder for drivers to see pedestrians. Consider wearing light-colored or reflective clothing, using a reflective or illuminated collar for your dog, and bringing a flashlight. Pets can suffer from seasonal allergies just like us. If you notice your pets excessively biting, licking and scratching their skin, it may be time to call your veterinarian. He or she can rule out other possible causes and determine the best course of action. While certain pests are more active in the warm months, many are still around in the fall (and even the winter in southern climates). In fact, fleas and ticks love to hang out in leaf piles, and mosquitos can breed in standing water caused by yard debris. Mosquitos can transmit heartworm, among other diseases. The best defense? Year-round preventive medication and regular yard maintenance. Taking your pet for a car ride? Watch out for antifreeze drips on the ground. Many people winterize their vehicles this time of year, including replacing the antifreeze. It has a sweet smell that can tempt pets, but it’s highly poisonous when ingested. Keep antifreeze away from pets (and kids) at all times, and take them to the veterinarian immediately if you suspect that they’ve been exposed. 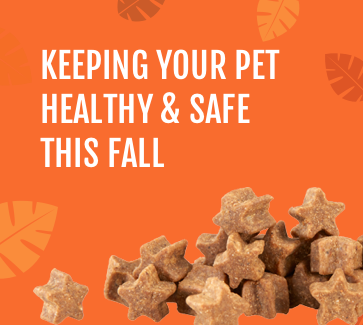 As always, your pet’s diet is the foundation for their overall health. So, feeding them a natural, high-quality diet with real ingredients like Tiki Pets™ helps ensure that you’ll enjoy many more autumns together. Have any fall safety tips? Share them with us on Facebook!